If you have never heard of Steve Coe or met him, now is the time. He is a vintage Class C Harley Racer who has raced for 15 years and finished every one of them, finished in the top 5 in some. You will find him probably towards the back of the pack most of the time, grinning and waving to the fans in the stands. He truly loves what he does and is even better at restoring his old bikes. He lives in Daytona Beach and has since 1973. Born in Columbus Ohio, moving to L.A. in the seventies, (when California was nicer) and all the while loving motorcycles first and foremost. 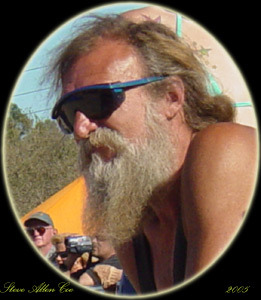 We met Steve at The Cabbage Patch bar during Bike Week 2005 where he had is vintage Harley Davidson mobile museum set up. Steve told us as we chatted with him that his real claim to fame is that he has finished every race he has started. But you can see that he is also a lover of his machines and keeps them in top condition.